For two years, we’ve wondered what Quantum Break actually is. Having seen it, I’m now worried that Quantum Break is a bland-looking shooter interrupted with 20-minute episodes of bad television at the end of every chapter. It should be so much better. The setup is that you play Jack, a man who gained superpowers by standing too close to an exploding time machine. Shortly after the time machine explodes, your brother, the person who built the superpower-granting exploding time machine, is killed by someone who has travelled back in time from 17 years in the future. The presenter running the demo showed off a gunfight against some hired goons. He was making use of all the powers at his disposal, dashing up to enemies and hitting them with fancy melee attacks, pausing time and flanking to shoot the goons in their rear, and making people inexplicably explode with time balls. But it wasn’t exciting to watch. None of these powers are new. They look nice in Quantum Break, but they don’t feel original like Max Payne’s Bullet Time did when Remedy first attempted time manipulation 14 years ago. Unlike with Bullet Time, there are enemies in Quantum Break who wear special suits that protect them from your time powers. Their presence will complicate skirmishes, but you just have to dash up them and shoot them with a shotgun. Again, special enemies who specifically counter your abilities is nothing new. Out of combat you can use the abilities to help with environment puzzles. The demo kicked off with Jack chasing the villain, Paul Serene, through a shipyard. Paul escapes in a helicopter but before he goes he throws a time bubble at one of the ships near Jack. Paul also, for some reason, has time powers. Maybe he also stood next to an exploding time machine. The shipyard begins to collapse and then stutters between a state where it’s fine, and a state where it’s collapsed. Routes between the rows of shipping containers appeared and disappeared as they jumped between what they looked like before the collapse and after. Using Jack’s dash and time pause, our presenter was able to work through without being crushed. Graphically, the whole platforming section looked good, especially the effect of the environment skipping and jumping between different states. But it’s hard to get excited about another platformer where you control time. Quantum Break’s other half is the television series that splits up the game’s chapters. At the end of each chapter is something called a ‘Junction Point’. There, control switches to Paul, the villain. You’re given a choice to make and your decision is reflected in the following episode. For instance, in one case you can choose between being ‘Hardline’ and ‘PR’. (Two terms that don’t exactly inform you about the decision you’re making.) This decision then plays out in the episode. If you chose ‘Hardline’ then the episode will include a scene where Paul’s men capture a witness of their more clandestine acts. Rather than risk her telling people what she saw, they kill her. If you chose ‘PR’ then you will see a different scene, one where Paul’s men will threaten the safety of her family and she will agree to help them. She will also remain a character in the story and have an effect on the game. While an interesting idea, it seems out of place in Quantum Break. The programme seems to interrupt the game rather than thread into it. In Max Payne and Alan Wake, television series were part of the world and informed the fiction but they didn’t insist on taking up 20 minutes of your time. You could walk by the television screening episodes of Lords and Ladies and Captain Baseball Bat Boy in Max Payne. In Quantum Break you have to just put the controller down and watch. What you’re watching doesn’t seem too good, either. Despite having actors like Aidan Gillen and Lance Reddick from The Wire and Dominic Monaghan from Lord of the Rings, the performances in the scenes we were shown were, like the gunplay, dull. It didn’t help that the script was all clichés. Remedy games have always had hammy writing, but in Max Payne it worked with the noire theme. 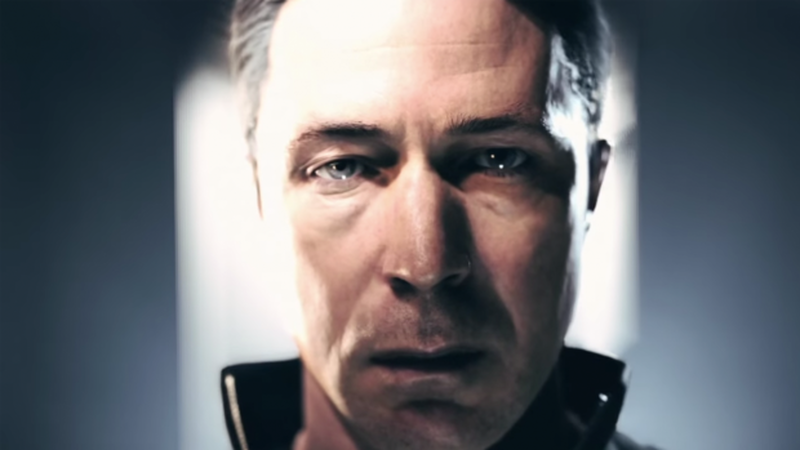 Quantum Break seems like a serious attempt at sci-fi, but not a great one. I really wanted Quantum Break to excite me, but the demo left me disappointed. What would save it? If the series and the game were tightly integrated, the gunplay were lively and satisfying, and that the platforming was pretty much cut from the finished game. There’s still time.